Quad SoftTech is a Web Application Development Company provides customized Web Application Development services with the latest technologies which suit your requirement that help increasing work efficiencies and reduces working costs. We can develop Web Applications which is competitive enough to work with all kinds of web technologies which is customized for your industry for the best outcomes. To develop a Web Application, we initially study your company's details from scratch and then provide you an exquisite solution as per your need. Our aim is to keep the interface simple enough so that it can be understood easily by non-technical people as well. Our team has expertise in IT consulting and outsourcing, providing customized application development, outsourced product development and eCommerce website solution. We are here for you to implement intricate and complex technology solutions in minimum time with affordable cost. 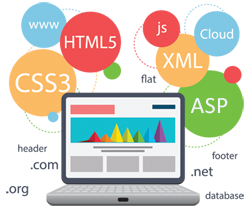 As a professional Web Application Development Surat based company we have a team of experts who have flawless knowledge in various technologies. Our development and deployment procedures have proven methodologies and highly efficient techniques. Quad SoftTech a Web Portal Development Surat based company has pioneered the domain and has successfully executed top of the line portals that incorporate the latest technology and most interactive options to attract users to your website. We have an agile team of professionals who understands the technicalities involved in the process of Website Portal Development and give customized solutions to fit to your specific requirements. The importance of integrating the latest technology development platform with an attractive usable design and navigation puts Quad SoftTech apart from a regular web development company in Surat. Web Portal differentiates from a normal website in its usability. Web Portals primarily focus on online community building and get users to register and use the services on a regular basis. The repeat factor of business is very important while designing and developing a portal for a client. Theme based portals have become very successful as they create a niche and target specific users for that community.